PINION GEAR DEPTH. - The pinion gear depth refers to the distance the pinion gear extends into the carrier. Pinion depth affects where the pinion gear teeth meshes with the ring gear teeth. Pinion gear depth is commonly adjusted by varying shim thickness on the pinion gear and bearing assembly. PINION BEARING PRELOAD. - The pinion bearing preload is frequently adjusted by torquing the pinion nut to compress a collapsible spacer. The more the pinion nut is torqued, the more the spacer will compress to increase the preload or tightness of the bearings. With a collapsible spacer, only tighten the pinion nut in small increments. Then measure the pinion preload by turning the pinion nut with an inch-pound torque wrench. When a solid spacer and pinion nut are used, shims control pinion bearing preload. The pinion nut is torqued to a specific value found in the service manual. To set pinion bearing preload, use a holding tool to keep the pinion gear stationary. Then a breaker bar or torque wrench can be used to tighten the pinion nut. CASE BEARING PRELOAD. - The case bearing preload is the amount of force pushing the differential case bearings together. As with pinion bearing preload, it is critical. If preload is too low (bearings too loose), differential case movement and ring and pinion gear noise can result. If preload is too high (bearings too tight), bearing overheating and failure can result. When adjusting nuts are used, the nuts are typically tightened until all of the play is out of the bearings. Then each nut is tightened a specific portion of a turn to preload the bearings. This is done when adjusting backlash. When shims are used, a feeler gauge is used to check side clearance between the case bearing and the carrier. This action will let you calculate the correct shim thickness to preload the case bearings. Refer to the service manual for special equipment and procedures. RING GEAR RUNOUT. - The ring gear runout is the amount of wobble or side-to-side movement produced when the ring gear is rotated. Ring gear runout must not be beyond the manufacturer's specifications. To measure ring gear runout, mount a dial indicator against the back of the ring gear (fig. 5-20). The indicator stem should be perpendicular to the ring gear surface. Then turn the ring gear and note the indicator reading. If the ring gear is within specifications, locate a position on the ring gear that indicates ONE HALF of the maximum runout on the gauge. Mark the gear at that point. Then rotate the ring gear until the teeth on the opposite side of the gear from the mark are in mesh with the pinion gear. 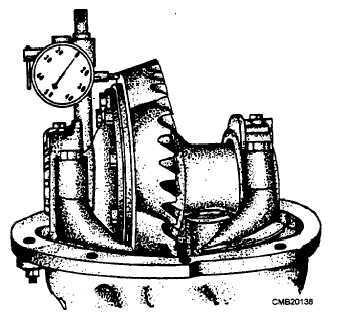 If ring gear runout is excessive, check the ring gear mounting and differential case runout. If not a mounting problem, replace either the ring gear and pinion or the case as needed. As the gears operate, they produce friction and heat. This makes the gears expand, reducing the clearance between the meshing teeth of the gears. Without backlash, the ring and pinion teeth can jam into each other and fail in a very short period of time. However, too much ring and pinion backlash can cause gear noise (whirring, roaring, or clunking). Figure 5-20. - Measuring ring gear runout.